It is early morning and the sun didn’t even rise yet. I just woke up, huddled closely against my mom. She is so warm and I feel so safe when I am near her. She wouldn’t let anyone hurt me. I can hear the sounds of the night. Birds you may have never heard of, the singing of cicadas, the call of a lion far away. I am not afraid. I am a rhino and my mom and aunties are here to protect me from all the wild animals out there. Slowly everyone is waking up and we are making our way to the water hole. I love to play by the water. My mom tells me to be careful. You never know who else is here. There might be a crocodile hidden underneath the surface. But I’m not afraid. I never am. We are about to leave and I run ahead because I am a wild child and I love to jump around. Then I hear it. A loud noise that makes my blood run cold. I turn around and see my mom lying on the ground. She is not moving. The noise must have startled her too. I run towards her but all of a sudden two men are there right in front of me. Bend over my mom they are beating her with something. She still doesn’t move. She has to fight back! She is so much stronger than those small humans. But she doesn’t fight. I’m trying to get to her, screaming from the top of my lungs. One of the men kicks me in the face. I trip backwards and fall. I’m all dizzy now and sick to my stomach. My face still hurts as the men walk away. Carefully I stumble closer to my mom. I want to be there when she wakes up. Her face looks different. She is bleeding all over and her horns are gone. I try to wake her but she just won’t open her eyes. So I stay with her screaming and crying for hours until I have no more energy left and I lay down next to her. Poaching is happening every day in all parts of Africa and the statistics of The Wildlife and Environment Society of South Africa – short WESSA – prove that time is short until there will be no more rhinos left to save. 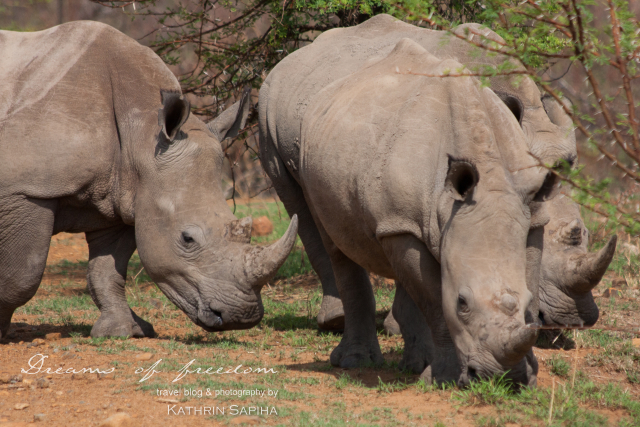 In 2014 alone there have been 1020 rhino killings reported. If we don’t act now, our grandchildren may only learn about rhinos from books and old movies. Last year I had the chance to travel to South Africa and see those gentle animals in their natural habitat. They are not afraid of humans. We got very close with the vehicle. Imagine how easy it is for those monsters who come to shoot with their guns instead of cameras! Green Travel Media and the non-profit Travelers Building Change have gathered 125 of the world’s top travel bloggers and writers to raise awareness for the #JustOneRhino campaign and support the Rhinos Without Borders project. 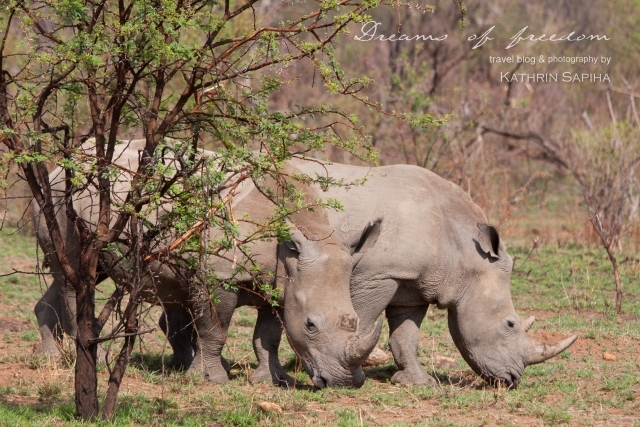 Under the direction of National Geographic Explorers In Residence, acclaimed wildlife photographers/filmmakers, and wildlife conservation advocates Dereck and Beverly Joubert, Rhinos Without Borders is planning on translocating 100 rhinos from South Africa to Botswanna, where they have some of the lowest poaching rates in Africa and the rhinos can be protected more effectively. The Botswana Defense Force and Wildlife Department is forming a “Tusk Force” team of anti-poaching specialists. Part of the raised money will provide training and equipment for that team. It costs $45,000 to move #JustOneRhino to a safer home but together we can make it happen! Help to protect a life and donate via Travelers Building Change. To make the giving even sweeter, every donation will give you the chance to win one of over $30,000 worth in prizes. Win a safari and visit the rhinos yourself, go on a tropical vacation in South America or Asia. 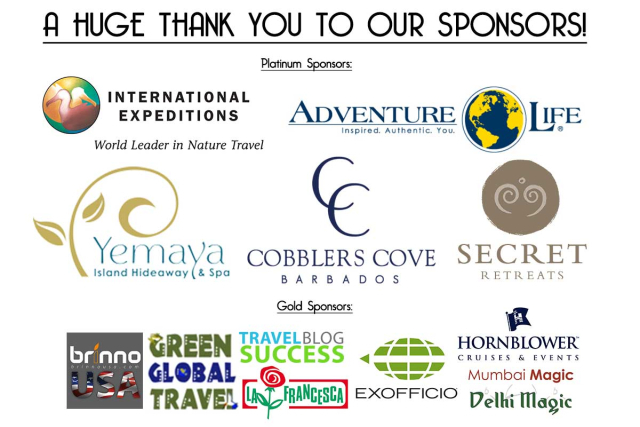 The prizes include tours and hotel stays in 11 different countries on 5 continents. Click here to see all the prizes and donate to enter the giveaway! You even get to choose your top 3 prizes. A $20 donation will get you 10 entries, $30 will get you 20, $50 will get you 30, and so on. You can enter until March 1st and the winners will be announced on March 3rd – which is World Wildlife Day. The amazing prizes have been offered by over 20 top sponsors who want to help raise awareness for the #JustOneRhino campaign. Again, all the prizes, more information and photos can be found here. If you can’t help: Spread the word! Don’t think you are unable to help just because you don’t have any money to spend. You can spread the word! Share this post on facebook, Twitter, Pinterest, Google+ and everywhere you can! Use the hashtag #JustOneRhino and let everyone know what is happening daily in South Africa and how they can help to stop it. Kathrin Sapiha is a bilingual travel writer and photographer and the founder of Dreams of Freedom. She has had the urge to travel since she was a child and could never stop. The purpose of the brand Dreams of Freedom is to encourage people to travel and especially to inspire women to pursue their wildest dreams. 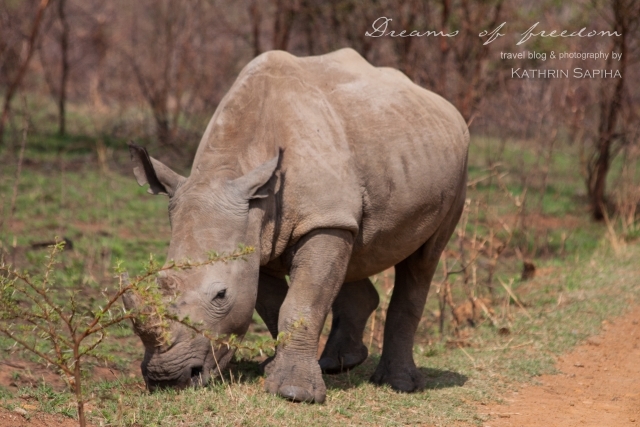 Your story of the young rhino is so beautifully written and sent shivers down my spine. 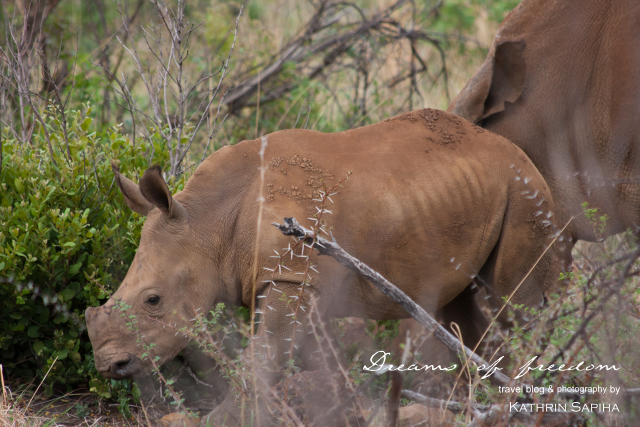 If only all young rhinos can live in a safe world where their mothers are there to raise them. Your story was heart felt as it should be for all who are concerned with our wildlife diminishing. The time IS NOW for us all to make a difference in our own ways. Awareness of the effect on our human race is the most effective way to make this change occur. You clearly have been called for this task. Keep reporting the news we need to hear. Your photography is also an effective tool in the fight to save our wildlife. Thank you for sharing and raising awareness! It’s my dream to go on safari to see the rhinos. I hope I can go soon! Beautiful photos.